The AMX-30 was used as the basis for a range of armored vehicles that have seen extensive service in the French army and elsewhere. In this Photosniper, which completes the study of the AMX-30 series by M.P. Robinson, the stories of France’s specialized artillery and engineer variants are explained. The AMX-30D recovery vehicle, the GCT and Au-F1 series of self-propelled guns, the AMX-30R Roland and AMX-30SA Shahine antiaircraft missile launchers, the AMX-30 Bitube DCA antiaircraft tank, the AMX-30H Bridgelayer and the EBG armored engineers vehicle are all covered in text and photographs. France’s comprehensive rebuilding programs that resulted in the development of the Au-F1TA, of the improved EBG versions and of sophisticated mine clearing versions of the AMX-30B2 in the decades since the end of the Cold War are also described. This work is an excellent reference for the modeler with over 180 photos; these include examples chosen from GIAT’s archives, photos of vehicles in everyday service, vehicles seen on the parade ground and in the desert wastes of Iraq. 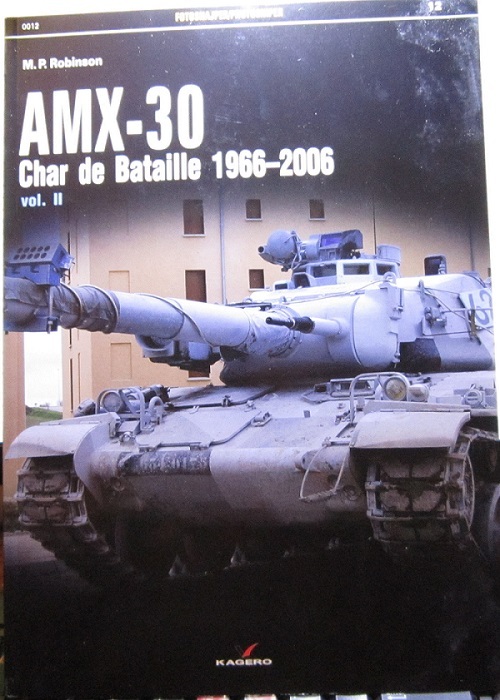 The second volume of Kagero's AMX-30: Char de Bataille covers the later part of the long career of the AMX-30 in French Army service. The text and photographic coverage is focused on the improvement of it. Kagero is a book publisher based in Lublin, Poland. They print their books in English. This book is soft cover of 87 pages in 8 ¼” x 11 ¾” page format. It came in a sealed clear cello bag. The cover has a photo of an AMX-30 parked in front of a building. The book contains 125 color photos. 43 of these are walk-around type, showing various parts of the AMX-20’s anatomy. Another 11 shots are in black and white. There are 6 illustrations out of tech manuals. At the back of the book there are 8 color side profile illustrations of the AMX-30 variants. The last 2 pages have more than 50 color cover arts of other books that Kagero markets. They are for aircraft, AFV’s and ships. This book will be of great interest to both modelers and armor enthusiasts. Highly recommended. I want to thank Casemate and the folks at Kagero for this review sample.